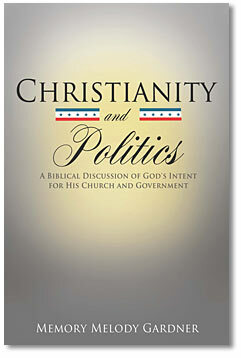 Christianity and Politics – Buy Now! Memory Melody Gardner’s new book, Christianity and Politics, was penned to help Christians gain a much bigger picture of God and His perspective on politics. Expect to be enlightened by how God’s people and the political systems of the world converged. Expect for the most controversial and divisive issues in the 2012 Presidential Election cycle among Christians and others to be addressed head on. Expect to be challenged by how God defines morality and how His definition should effect the way we vote and even discuss these divisive issues. Expect to be encouraged to find constructive ways to have conversations around these topics that end much better than you expected. This book expounds on the importance of having clear distinctions between the Church and government and what the different roles of the Church and government are. Memory Melody Gardner explains furthermore what the Church’s response should be to modern-day, politically charged issues. Christianity and Politics is a quick, but challenging read to gain understanding and perspective for your most politically charged conversations! Buy your copy today!